[Late last month, we probably bummed a fair number of you out by reminding you that Back To School season is just around the corner. While true, there’s still plenty of time left to get in one last excursion into the Great Outdoors before classes start. We encourage you to get out there, and of course, encourage you to stay hydrated and stay safe. Over the last few years, you’d need to be sleeping under a rock every night to miss two fairly large pop culture tidal waves: zombies and doomsday prepping. While both trends may seem to exist primarily as entertainment for most of us, the underlying logic behind why they’ve become so popular is quite sound. Quite simply, emergency preparedness is a fundamental skill many of us have seemed to forget. This is one of the reasons why the CDC of all organizations used a Zombie Apocalypse as their emergency preparedness metaphor late last year. Similarly, if you truly sit and watch programs like Doomsday Preppers, you find the tone leaning far more towards education than exploitation. For those that camp, hike or spend any extended time outdoors, emergency preparedness takes on a whole new meaning as a survival situation could come up at any moment. More often than not, this situation will likely involve the lack of clean drinking water. Made from high quality stainless steel, this gravity filter system can produce up to 2.11 gallons of clean drinking water at a time. It’s capable of removing a wealth of contaminants including bacteria, cysts, organic chemicals, metals and more! 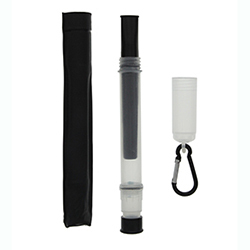 An ideal portable emergency water filter for a small family and a great item to bring with you on camping or outdoor adventures, especially if you plan on setting up camp daily. This compact water filter from Katadyn is capable of producing approximately .5 gallons of clean drinking water per minute. It removes contaminants including cysts, bacteria and sediment making it ideal for a single user in extremely isolated hiking, camping or trekking situations. The Katadyn Vario is made from high quality materials and is capable of taking numerous beatings while still functioning at full capacity. 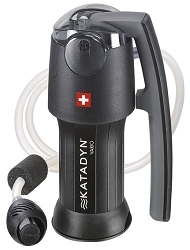 This is one of my personal favorite ultra-portable water filtration systems! One of the smaller water filtration systems designed for emergency preparedness that you will find, the Seychelle Pure Water Straw runs only about $15 but can be one of the most useful pieces of camping gear or additions to a bug-out bag. In the event of catastrophic failure of public utilities, or in the event of finding yourself lost in the middle of nowhere, this personal water filtration system will allow you to drink directly from many contaminated water sources without concern. While not as common to bring along on longer camping trips or excursions as a gravity filter or the Katadyn Vario, this water filter can provide a quick hydration solution. 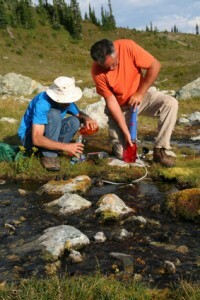 In 2014, the water filter market for camping, hiking, surviving and prepping will continue to grow – and at WaterFilters.NET – we’ll be among the first to carry some exciting new products and filtration systems. 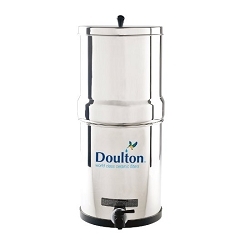 To be among the first with an opportunity to buy some of these new water filtration systems, I invite you to subscribe to this blog or our YouTube channel, like us on Facebook or follow us on Twitter or +1 us on Google+ to keep up on our latest product additions. While all of these water filters are great, and comparable to most on the market, there is still a small issue with all of these water filters, they do not remove viruses. As of now, there are only a handful of water filters and filtration systems that are portable that will remove both bacteria, and all viruses, and all of them are quite expensive. Once someone comes out with one that can remove both, with certainty, it will be the most popular portable water filter on the market.